Objective: To describe the radiological findings and the clinical importance of megacalycosis. Materials and methods: On the basis of a case report and literature review, diagnostic criteria and clinical significance of megacalycosis are presented. 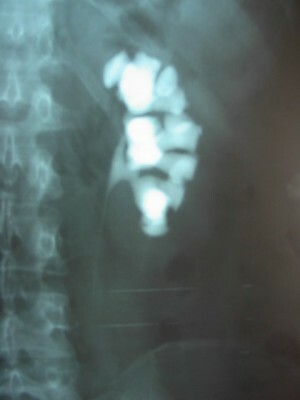 Result: Megacalycosis is mostly asymptomatic and is usually discovered either accidentally or as a result of its complications, such as stone formation, flank pain, hematuria, infection, and fever. The renal pelvis, infundibulum, and ureter are not dilated. Calyces have a semilunar configuration rather than the conventional triangular or conical form. The tip of each pyramid is flat, and the calyces possess neither fornix nor papillae impressions. The number of calyces is increased compared to the healthy condition, typically from 20–25. The renal parenchyma has a normal width but with a slight narrowing of the renal medulla. The kidney exhibits normal function, in particular with respect to its ability to concentrate the urine. Conclusion: Megacalycosis is a rare, usually unilateral dilatation of the kidney calyces in the presence of a normal, undilated renal pelvis and ureter. Its pathological significance lies in the occurrence of complications.